There are more than 400 dogs in the Virginia Dangerous Dogs Registry, a list of animals that have attacked someone or hurt or killed another dog or cat. You may have your own definition of what constitutes a dangerous dog. But Virginia law lays out a clear legal definition of what a dangerous dog is, and there are four in Richmond. “‘Dangerous dog’ means a canine or canine crossbreed that has bitten, attacked, or inflicted injury on a person or companion animal that is a dog or cat, or killed a companion animal that is a dog or cat,” the law states. In 2006, the General Assembly passed legislation requiring all dogs deemed dangerous by local animal control authorities to be entered into an online database. Local officials must provide various information about each pet, including its name and the owner’s name and address. Anyone can look up the information on the website of the Virginia Department of Agriculture and Consumer Services. There are more than 400 dogs in the database, from Snickers in Virginia Beach and Blondie in Richmond to Wolf in Powhatan and several named Bear. Elaine Lidholm, a spokeswoman for the department, says there is still controversy over the registry. More than 4.7 million people in the United States are bitten by dogs each year, according to the U.S. Centers for Disease Control and Prevention. Roughly 800,000 bites require medical attention; half of them result in a trip to the emergency room. About 12 Americans die each year due to dog attacks. 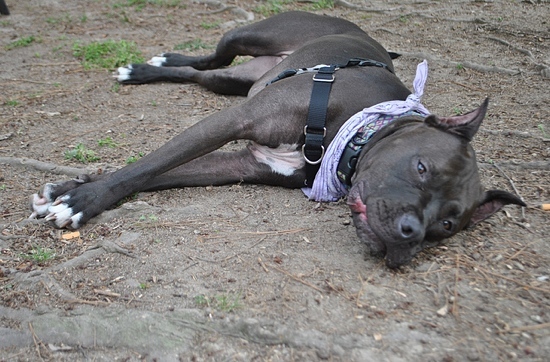 Some states have dealt with the problem by banning specific breeds of dogs, such as pit bulls. Virginia took a different approach– focusing on the dog’s behavior, not its breed. The American Kennel Club, the American Humane Society, and other pet-friendly organizations support that position. Adam Goldfarb, a spokesman for the American Humane Society, said his organization likes the way the Virginia Dangerous Dogs Registry is set up. The American Kennel Club also supports the Virginia law because it offers a dog a “fair process” before deciding whether to add the animal to the registry. Lisa Peterson, a spokeswoman for the American Kennel Club, said more than 100 localities across the country have banned certain breeds, most commonly pit bulls. While three of the four “dangerous dogs” in Richmond are pit bulls (the other is a lab), it would be unfair to condemn an entire breed, according to Ring Dog Rescue, a Henrico County-based dedicated to adopting out “bully” breeds. Owners of dogs deemed dangerous must maintain a minimum of $100,000 in liability insurance for the animals and must provide proof every year that the policy has been renewed. The animal must wear a muzzle if not on the owner’s property. For dogs that end up on the Dangerous Dogs Registry, it can sometimes seem unfair.